Federal Air is an airline based at O.R. Tambo International Airport in Johannesburg. It operates charter flights, shuttle services and scheduled services in Africa. It has hubs at Durban's Virginia Airport, Kruger Mpumalanga International Airport, Lanseria International Airport, O.R. Tambo International Airport and Harare. 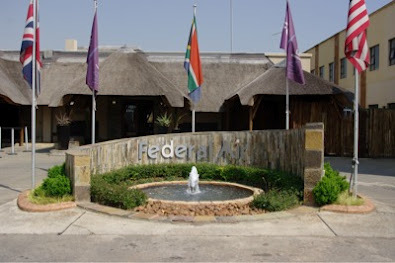 Federal Air started business as Comair Charters (Natal). Pelican Air Services is a subsidiary of Federal Air. Federal Air has announced a new service between the Kruger National Park and Phinda Private Game Reserve. This route will be operational from the January 2017. They will offer flights between Phinda and Neslpruit and continue offering flights between Phinda and Johannesburg on Sundays, Mondays, Thursdays and Fridays. Prices will start from approximately R4450* per direction. It is announced that the fastjet-Blockbuster JV will use Federal Air's license to operate flights from 31 May 2013. Federal Air announces that it has appointed Inspirational Places for international sales and marketing. Contact fedair@inspirationalplaces.com for all enquiries with regard to Federal Air Sales & Marketing. After 10 years of flying the route, Federal Air quits Johannesburg to Vilanculos flights. Troy Reiser, MD of Federal Airlines for the past 14 years has made the decision to return to his Homeland in the USA, to explore new business ventures. Evan Baillie, will take up the reigns as Federal Airlines' new Managing Director. Rachel Muir is taking on the role as Financial and Administrative director. The KwaZulu-Natal shuttle service is extended to include Virginia, so that on weekdays flights occur from Pietermaritzburg to Virginia to Ulundi. Price on 9 Oct 2012 was R980 1-way. Due to increasing fuel prices, Federal Air has raised the fuel surcharge on Vilanculos flights to R150/sector, effecive immediately on all new bookings. Bateleur Air Charter merges with Federal Air, and relocates to FedAir's facilities at Johannesburg O.R. Tambo International Airport. FedAir commences flights between Ulundi & Pietermaritzburg; and indicate that they may in future extend it to flying to Durban’s Virginia Airport. Our first Federal Air flight, to Vilanculos from Johannesburg (cost R10,599 for the 4 of us including an infant). And what an idyllic spot the islands off Vilankulo proved to be. David flew Federal Air to Sabi Sands: "like celebreties we fly into Sabi Sands... Free tea and coffee as well as a well stocked bar for those who might find flying in a small plane daunting... "
Federal Air offer a daily shuttle service between Johannesburg OR Tambo International Airport and Nelspruit’s Kruger-Mpumalanga International Airport to selected lodges in Sabi Sands private game reserve in the Kruger National Park, Madikwe private game reserve in North West Province and selected reserves in Northern Kwa-Zulu Natal. Federal Air in Pietermaritzburg may be contacted at 033-3462580 and in Ulundi at 071-1272119.